Launched back in 2012, AzireVPN was created by Netbouncer AB, a Swedish company. AzireVPN provides a straight-forward and intuitive VPN. In an age where VPNs are becoming increasingly advanced, it’s great to see something users can get going with quickly. 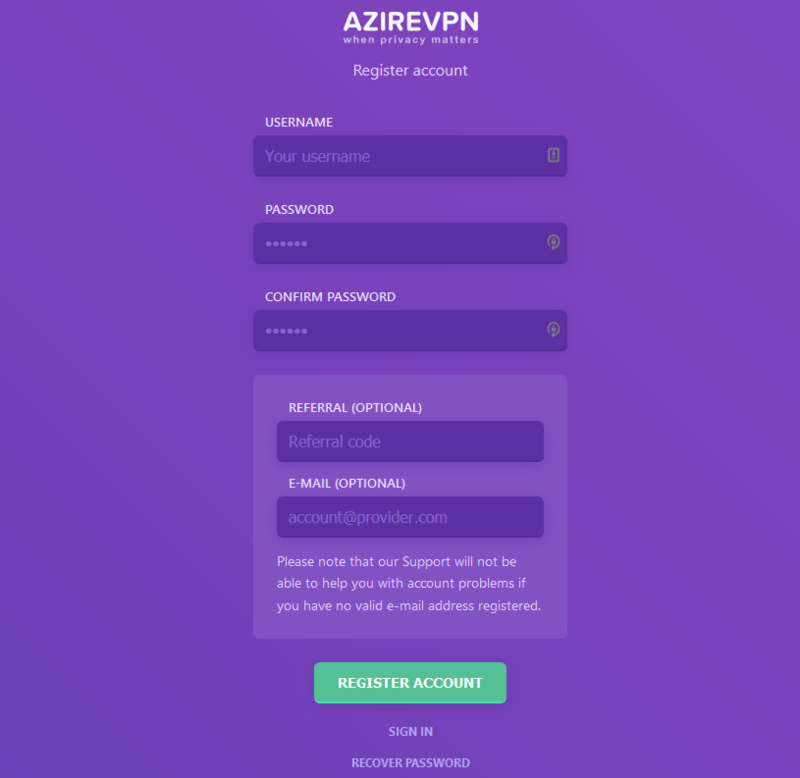 With some strong claims of offering a privacy-focused and secure VPN, it’s time to put AzireVPN to the test, and see what they can offer to customers. Does AzireVPN deliver a service that rivals the big boys in the business? It’s time to find out. Torrenting Policy: Yep, go for it! A sweet and short section: AzireVPN allows torrenting without restrictions on all their servers – nice. Honestly, it’s a feature we’ve come to expect from great VPN services, so it’s always an unpleasant surprise to see it missing – and a nice reassurance when it’s present! This is surely great to see — but if you want to check out some other VPNs that support torrenting, here’s a list of our top picks. Pricing & Plans: Extremely cost-effective! All subscription plans allow the use of up to five devices simultaneously, and access to all of AzireVPN’s features. There’s a 7-day money back guarantee too, and a 24-hour free trial. Overall, a solid offering in terms of pricing, device support and peace of mind if you don’t like the service. The only improvement we’d like to see here is maybe some longer money back guarantee and free trial periods. We’ve seen trial periods of up to 14 days or more, and money back guarantee periods of up to 30 days, so there’s certainly room for improvement here. That said, still a solid offering by AzireVPN! Payment Methods: Pay with just about anything! It’s extremely rare to see a VPN provider taking cash payments. AzireVPN happily takes postal orders for all its services and all you need to do is send in the cash for the subscription you want along with your username or email address. We also love the range of cryptocurrencies on offer here; many services stop at Bitcoin, the most popular currency. AzireVPN goes above and beyond, offering a range of options here – nice work, Azire! AzireVPN supports Windows, macOS, Linux, Android and iOS! It’s a decent offering for sure, and it’s made even better when you realize they support routers that run OpenWrt. That means users are able to set up routers and run a virtually unlimited amount of devices via the VPN’ed router. Nice! 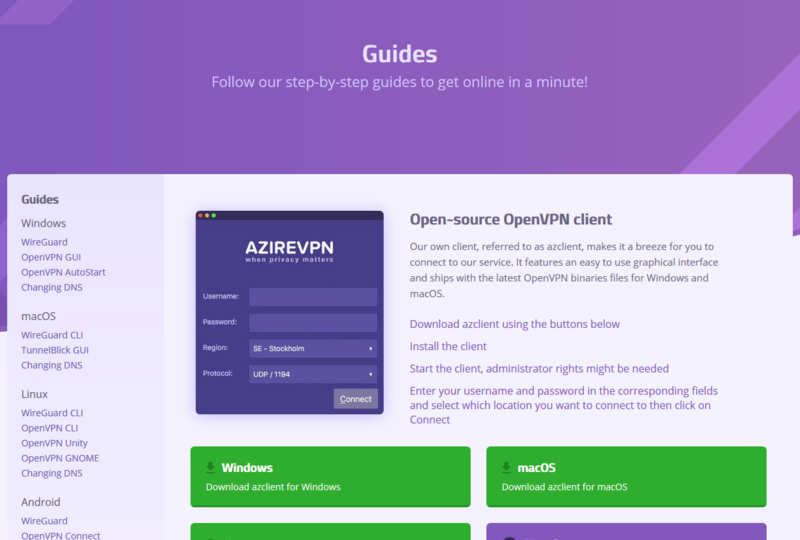 Setting up AzireVPN on all devices is easy and their website offers comprehensive guides for all supported platforms. Signing up takes a matter of seconds. All you need to enter is a username and password – that’s it. There is the option to add your email address to your account, but this is entirely optional. If you want customer support though, you do need to sign up with your email address. Nice to see the option for complete anonymity! It’s quick and easy to use AzireVPN through a lightweight desktop application. It’s a simple click-and-go interface through which you choose where you want to connect and which protocol you want to use—though, with only two dozen or so servers, it shouldn’t take long to choose regardless! AzireVPN’s website has an expansive knowledge base, FAQ section and lots of feature documentation to help new users get to grips with the product. From setting up devices to work with AzireVPN, to providing information on how they protect users, what protocols they use, and much more. Customer support provides bespoke replies to all queries; no copied and pasted responses to be found here. It’s reassuring to know support will have your back, should you have any problems or questions around their service. Safe to say, your information is your own! This is a win for AzireVPN. Great job on the security, AzireVPN, great job. Encryption and Protocols: Security is TIGHT! The default protocol AzireVPN uses is OpenVPN—considered by many as the industry standard—in addition to AES-256 encryption, which is currently the most secure encryption on the market. In addition to these, AzireVPN offers WireGuard, a relatively new and secure tunneling protocol. It is currently not compatible with Windows, though. If you haven’t realized by now, AzireVPN offers a super-secure VPN environment. We put AzireVPN through ipleak.net and they’ve passed. We expect solid security and privacy from a VPN – we’re happy to see AzireVPN has delivered on this front. AzireVPN uses a contact form on the support page of their website. It can be found by clicking on the Support tab and then scrolling down. When you email AzireVPN, you’ll usually receive a reply in a matter of hours. We’d have like to have seen some live support – something we love to see – but a quick response ticket system is also great. In terms of customer support, Azire ticks all the right boxes. AzireVPN offers just one server (Stockholm, Sweden) that allows access to geo-blocked Netflix content. Combined with their speeds, and we don’t hold much hope for a reasonable experience. 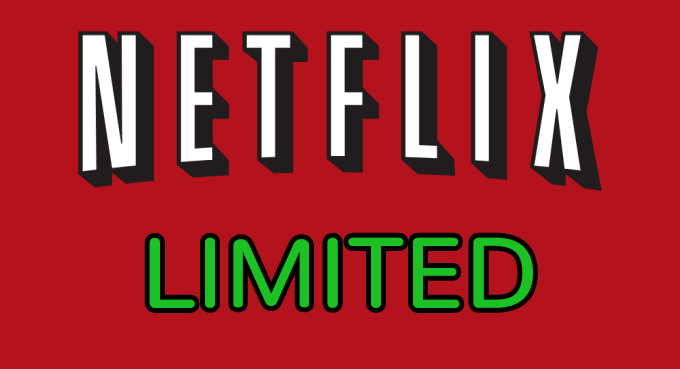 If you’re looking for a VPN to access Netflix in other countries, look elsewhere; 1 server is a poor offering by anyone’s standards (though it’s better than no server at all). Let’s not forget, streaming from a Swedish server means you won’t have access to US-content. If this bums you out, you’ll be better off with another option from our list of best VPNs for Netflix. Servers & Locations: 22 servers? Where’s the rest, Azire? At the time of writing this review, AzireVPN had servers available in 5 different countries and a total of 22 active servers, located in Canada, Spain, Sweden, the United Kingdom, and the United States. For a company that’s 6 years old by now, we expected to see more – a lot more. 22 servers isn’t a lot by any measure; combine that lack of servers with poor server speeds? You’re left with a relatively poor service; onto the speed and performance tests. VPN Speed & Performance: Keep those megabits coming, please! Our download speed without a VPN tops out at around 250Mbps, while we typically average speeds of 230Mbps. We tested a few servers from AzireVPN’s service; specifically, servers in Spain (Malaga) and Canada (Toronto). So…yeah. We’re missing a few bytes here AzireVPN, just a few. It’s safe to say, AzireVPN is slow – very slow. AzireVPN does not have a kill switch. The lack of a kill switch means that AzireVPN’s use can be quite risky – we’re not overly impressed with the protection AzireVPN offers. Somewhat disappointing, to be sure. AzireVPN is owned by Netbouncer AB. They’ve been in business since 2012. Their mission is to bypass censorship. To accomplish this goal, they’ve recruited a team of security professionals to provide the VPN service. In 2017, they launched WireGuard-powered VPN servers. AzireVPN is registered in Sweden and operates under the country’s jurisdiction. Unfortunately, Sweden is part of the Fourteen Eyes Alliance, a network of countries that share intelligence to collaborate on matters of security. This means users may be prone to having their data requested by governments such as the U.S. and the UK. AzireVPN has the potential to be a fantastic product. At the moment, however, there are a few factors holding it back. There’s a severe lack of servers—22 across 5 countries. There’s also a lack of kill switch, and speeds leave something to be desired. The lack of strong Netflix support is another letdown. While AzireVPN is competitively priced, has fair customer service, uses strong encryption and is easy to use, its potential is held back by missing the basics of what a good VPN should provide. If you want a strong VPN, AzireVPN is not what you’re looking for. Instead, search our top 10 VPN reviews and find something better!